It’s been said that “love for money is root to all evil” and the sad reality is that people are ready to go above and beyond solely for the purpose of becoming reach, even if that means making others miserable. The wild animals trafficking is one of those cruel ways of making money. 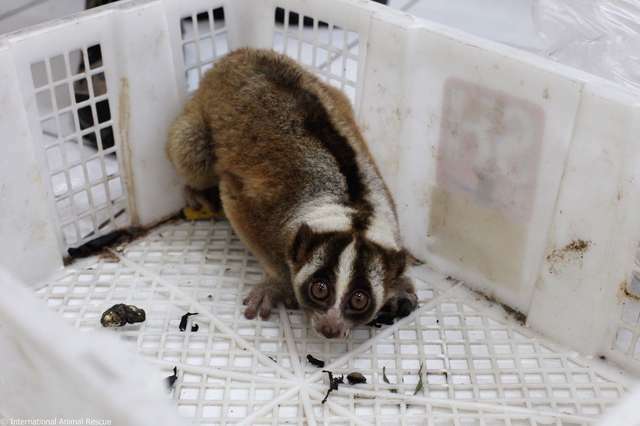 Recently, 79 slow lorises had been found stuffed into tiny crates. The poor animals were left with not enough food or water, starving, scared, and left fighting for their life. Slow lorises are one of the most widely illegally traded animals. People love them for their unique looks, but very few are aware that they are on the verge of extinction. Hopefully this story will serve as a wake-up call for the animal lovers and activists who would spread the word of the issue even further. The number of slow lorises that are poached from their natural habitat to be illegally sold is very huge. These particular animals that were reported by a neighbor who had noticed how two men were placing them into the boxes were taken from the jungle in West Java, Indonesia. The final destination was supposed to be China, where they would end up as someone’s pets. 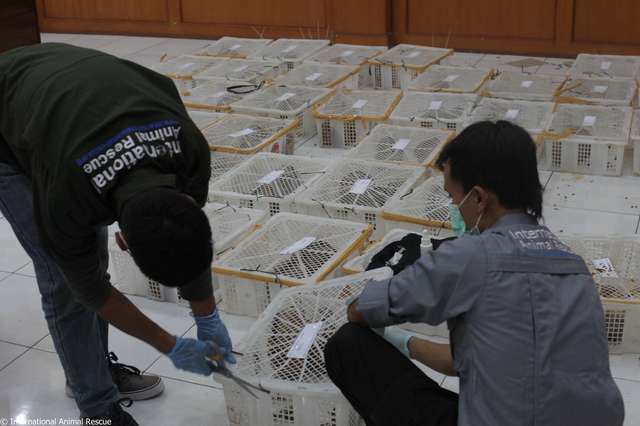 After the authorities were informed about the case, they arrested the traffickers and quickly reached out to the officials of the West Java Regional Office of the Forestry Department (BKSDA) and International Animal Rescue (IAR). The rescuers arrived in no time, but unfortunately, the animals were in a very horrible condition and it was way too late for some of them. 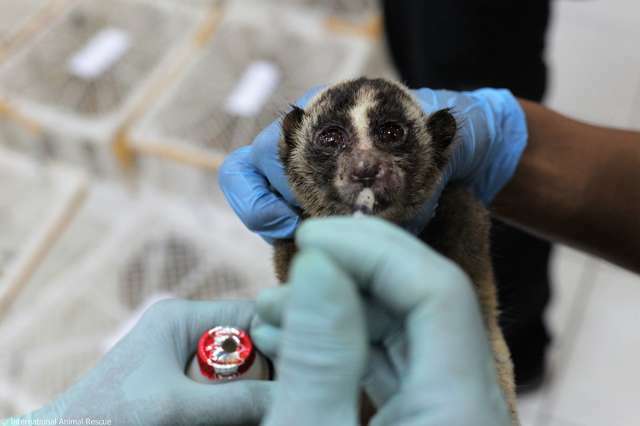 According to International Animal Rescue, during the process of transportation, which is done in overcrowded and poorly ventilated containers, 30 to 90 percent of the slow lorises die. After thorough examination, it was determined that almost all of the animals’ bodies were covered in bruises, wounds, and bite marks. Doctors assumed they were attacking each other in a state of panic and fear, and it is heartbreaking to hear. One of the slow lorises had a BB gun pallet firmly stuck on his cute little face. “That poor animal must have been in terrible pain until he came into the care of our medical team,” Key said. 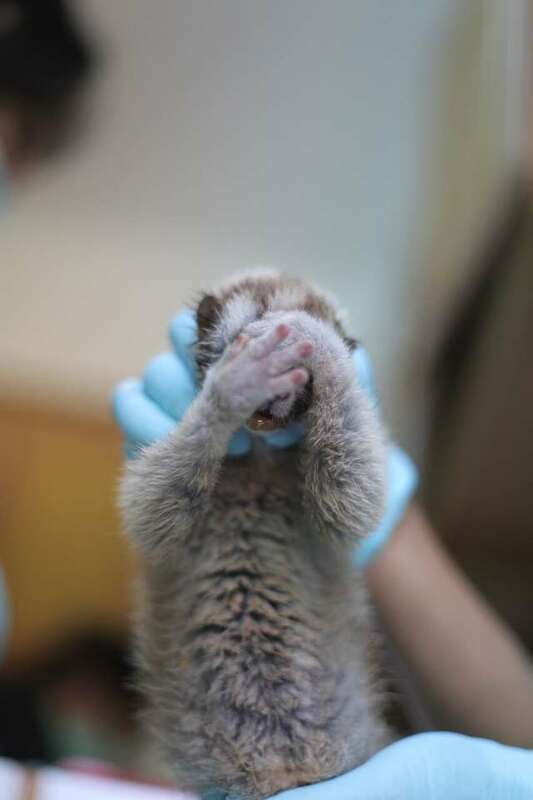 The rescuers were more than happy to be able to nurture these overly cute animals back to health, and eventually release them into the wild again. Unfortunately, many have died in the hands of the monsters who made them suffer this way. Slow lorises are known for their potentially deadly venomous bite, so in order to make them more pet worthy before they are sent to the buyer all their teeth are extracted with a nail clipper or a wire cutter with no anesthetic. The ones that had been discovered had their teeth, and that was some good news. You have probably come across videos online of slow lorises being tickled. This is presented as something cute and something they enjoy, but on the contrary, it is very painful for them and lifting their arms up is a defense mechanism. What many people don’t know is that they are nocturnal animals, which means they are active during the night, so being exposed to light while being kept in brightly lit places causes pain and suffering. “They are certainly in the best hands now, and our team will give them the best chance of recovering and returning one day to their home in the rainforest,” Key said. 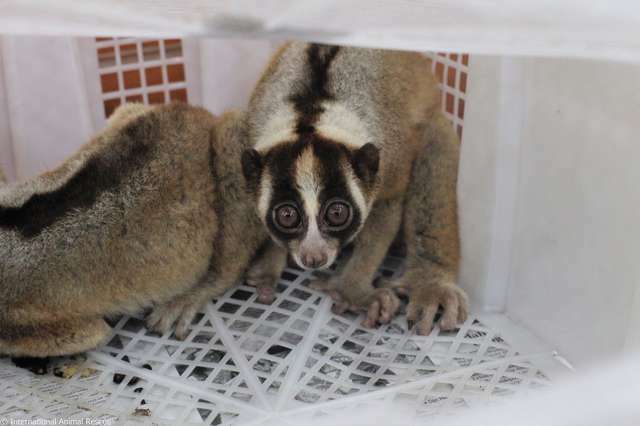 The IAR staff is glad they managed to save most of the slow lorises.